• Protect the economy of the City and all of Southern California. It is well established that earthquakes occur on fault systems where stress has accumulated over periods of centuries to millennia. The specific factors that trigger individual earthquakes are typically unknown, but researchers have recently found links between seasonal variations in earthquake occurrence and local changes in water storage and temperature. Using data from high-precision continuous GPS stations in Northern California, we observed a small 3 mm horizontal expansion of the Earth's crust prior to and in the vicinity of the August 2014 M6.0 South Napa earthquake. By analyzing the previous eight years of GPS data, we additionally found that a similar pattern of crustal motion repeats every summer. We have determined that this crustal expansion releases pressure on nearby faults, including those in the South Napa fault system, making them more likely to slip during the summer months. Large seasonal variability in the amount of groundwater in the Napa Valley and Sonoma subbasins may contribute to the observed changes. Seismic loading criteria are developed for various types of structures in the State Water Project (SWP) to use in future designs and evaluations. The SWP system supplies water for almost two third of Californians and about 750,000 acres of irrigated farmlands. It is critical for the California economy. Seismic risk is considered one of the greatest contributors of all potential risk categories for the SWP. California is considered one of most seismically vulnerable areas in the world and most of the SWP facilities are located in central and southern California, which are seismically active areas. The purpose of developing seismic loading criteria was to have an economically feasible SWP system that would provide adequate protection against the loss of life, property damage, and interruption of water delivery during and immediately after a seismic event. Most of the existing SWP facilities have not been evaluated since they were built in the 1960s. The knowledge of ground motion predictions and seismic analytical methodologies has significantly progressed since the1960s. As part of the development of the seismic loading criteria, current design standards used by Department of Water Resources (DWR), other similar agencies, and regulatory/code entities were gathered and utilized to select appropriate minimum loading levels for different types of SWP facilities. In addition, the process of criteria selection included consideration of the consequences of failure such as loss of life, property damage, and interruption of water delivery. The consequence of interruption of water delivery was somewhat difficult to quantify because DWR delivers water to the water contractors and they either store it in their storage facilities or distribute to the local agencies. The recommended loading criteria include consideration of consequences of failures in the selection process. The Division of Engineering (DOE) in DWR should use the seismic loading criteria recommended in this report for the design and evaluation of both new and existing SWP facilities. Seismic loading criteria is provided for most of the structures associated with the SWP—reservoirs , dams, canals, pipelines, tunnels, check structures, pumping and power plants, buildings, bridges and utility overcrossings of the aqueduct. 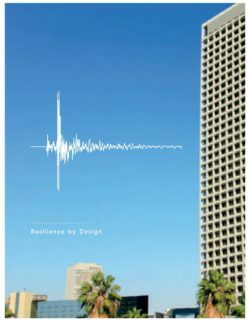 The seismic loading criteria should be used for these structures and associated appurtenant facilities in the future. 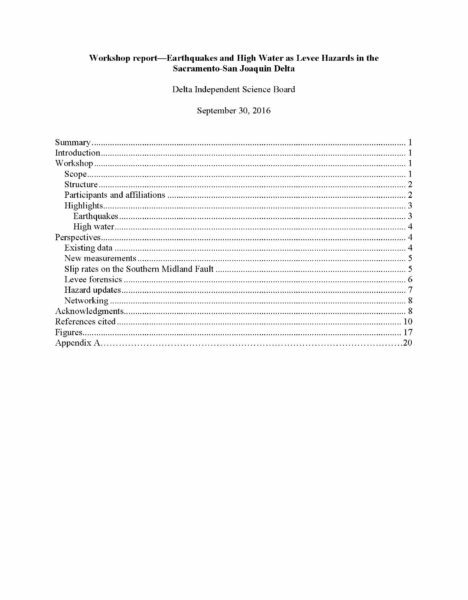 A project engineer can use a larger loading criteria than what is recommended in this report based on project specific factors such as: 1) the consequences of interruption of water delivery, 2) the impact on existing habitats and the environment, 3) the operational aspects of the facility in relation to water delivery, 4) the repair cost and time to return the system back to operational status, and 5) the availability of an emergency back-up system to temporarily make the facility operational until all the repairs are completed. 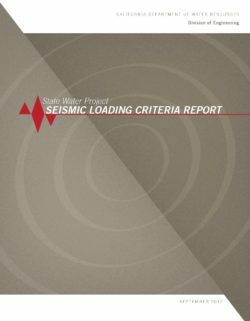 The criteria recommended in this report are considered current; however, these seismic loading criteria should be reviewed and updated every five years to make appropriate changes based on future operational requirements and on changes in state-of-practice. This is the first time DWR has developed loading criteria for the entire SWP facility and many of these facilities have not been evaluated to determine how vulnerable the system would be based on any seismic criteria. Therefore, these criteria are considered preliminary until the recommendations can be confirmed to be reasonable for the SWP facilities. 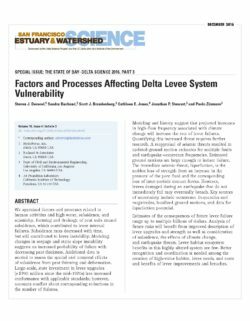 Earthquakes and high water as hazards to Delta levees were reviewed in a seven-hour workshop organized by the Delta Independent Science Board and held at the campus of the University of California, Davis. Earthquake hazards in the Delta were described in terms of ground motions from Bay Area earthquakes, infrequent earthquake recurrence on faults beneath the Delta, and levee fills prone to earthquake-induced liquefaction. Large uncertainties attend all these seismic elements of levee hazard. Those uncertainties, according to presentations in the workshop, include whether the Delta ground motions previously computed for Bay Area earthquakes were too large. Hazards from high water were deemed greatest from the confluence of high river discharge, wind-driven surge and waves, and high tides. Major risk assessments have used available data on these hazards without mandates to advance the science. Research needs and opportunities identified in the workshop include expanded observations of Delta ground motions, improved estimates of geologically recent displacement on faults beneath the Delta, further identification of liquefiable materials and mechanisms beneath levees, continued airborne measurements of land-level change, updated mapping of the contracting area of remaining peat, and fuller documentation of past levee failures. Recurring assessments of earthquake hazards and climate change provide precedents for periodic reappraisal of Delta levee risk. The workshop brought together different parts of the diverse community of Delta levee specialists. Positive responses to the workshop suggest that it served levee specialists and outsiders alike.